Seared Ahi Tuna is the sort of standard dish that you’ll find at any Asian-inspired restaurant, and it is one of my favorite things. 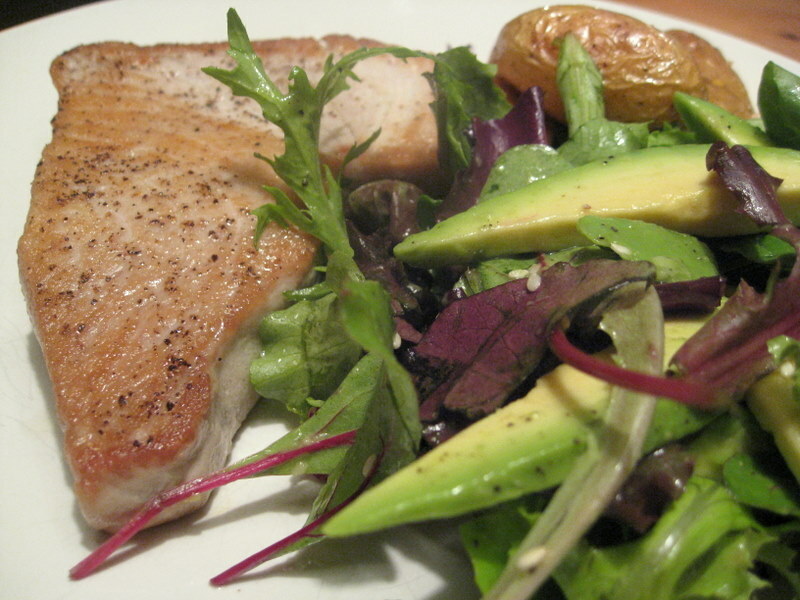 Like a good piece of steak, ahi tuna requires very little cooking time (if any at all). More, tuna is extremely fatty, so you’ll find that it cooks very well and also easily incorporates whatever flavors you choose to pair with it (soy, honey, etc.) If you purchase sashimi-grade tuna, you can feel comfortable eating it raw (we love to make sushi at home). For some reason, seared ahi tuna makes me think of my late teens, when I’d feel pretty swank ordering it at a dinner out with my parents, or on a date. It can sometimes seem a bit outdated on a menu–like a flourless chocolate cake or teriyaki salmon. That said, when done right, it’s almost always guaranteed to satisfy. Twenty years ago, seared ahi was probably considered an exotic, ‘ethnic’ dish that was served only at the fanciest experimental restaurants. I find it extremely pleasing to find it on menus in restaurants from California to Texas and Ohio. It’s the satisfaction of knowing that foreign culture, while it can sometimes take ages to permeate, eventually does. Change does come. It’s a glorious and elementary a revelation that seared tuna (shock-to-the-eyes raw inside!) has worked itself up from an unknown, to a relatively established staple to such an extent that its population is actually threatened. It’s good to see Sustainable Tuna fisheries springing up. These days, I rarely order seared tuna as a main meal at a restaurant. I’m more likely to experiment with fish and meats that I rarely cook at home. So when I walked past the fish aisle at Trader Joe’s and spotted an extremely fresh package of ahi, I decided that we should recreate an old hit in our kitchen. The ‘recipe’ for this fish is literally two steps. If it makes you nervous to eat raw fish, cook it for a minute or two longer but keep in mind that the texture and flavor of the fish will change dramatically. Raw tuna melts on your tongue and has a very delicate flavor, which we decided not to mask with too many ingredients. We roasted some fingerling potatoes for a simple accompaniment and threw together a fresh spring avocado salad. All three elements seamlessly came together for a very satisfying meal. 1. Season the fillets with salt and pepper, and oil on both sides. 2. Heat 1-2 tablespoons of olive oil in a skillet on medium-high heat. Place the fillets in the skillet and cook for 2-3 minutes on each side. Depending on how raw you like your tuna, you can sear it for as little as 1 minute on each side. The outside should look golden and be firm. 1. Toss all of the ingredients together in a medium bowl and season with salt and pepper, to taste. 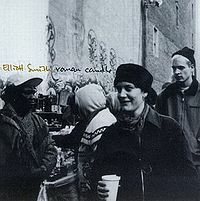 Roman Candle is definitely not Elliott Smith’s most upbeat album, but it is undeniably stunning. Despite the tension, alienation and restlessness of the lyrics on many of the album’s best tracks (“Roman Candle,” “Last Call,” and “Condor Avenue”), many of these same songs are complimented by light, happy melodies that call to mind Nick Drake, Simon & Garfunkle and James Taylor. It is probably for this reason that Elliott Smith constituted nearly half of the songs on the Good Will Hunting soundtrack including the song “No Name #3” from Roman Candle. Get Out Your Stretch Pants: Best Cookies Yet!